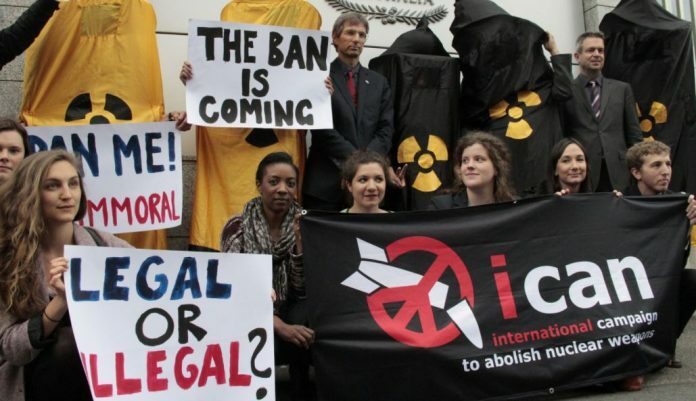 ICAN won the 2017 Nobel Peace Prize for campaigning and forming a coalition of nations that adopted the legally binding treaty prohibiting nuclear weapons. The Nobel Peace Prize for 2017 has been awarded to the International Campaign to Abolish Nuclear Weapons (ICAN), a coalition of organisations across the world that advocated for the Treaty on the Prohibition of Nuclear Weapons. This could not have come at a more opportune time, with escalating nuclear tensions on the Korean peninsula, and the U.S.— Iran nuclear deal in jeopardy. After years of sustained campaigning, in 2016 the United Nations General Assembly approved the negotiation of this new treaty on the prohibition of nuclear weapons, over the course of 2017. With the support of 122 states, the treaty was adopted in July and as the 50th state has ratified the treaty in September, it will ‘enter into force’ in December 2017. This means that it will be a legally binding international treaty, which prohibits acts including the development and testing, transfer, use or threat of use of nuclear weapons, manufacture, sale, production, stockpiling, deployment of nuclear weapons. The passage of this international treaty prohibiting nuclear weapons is not only a moral victory, but is a hugely significant legal victory. The treaty will also have an undeniable impact on nuclear states. International law now contains an explicit and absolute prohibition of nuclear weapons, something unthinkable a few years ago. What is significant about the treaty is that it explicitly recognises the ‘catastrophic humanitarian consequences’ of nuclear weapons, and refutes these weapons in no uncertain terms, calling for their total elimination. Remedying the ecological consequences of the use of these weapons and providing assistance to victims are codified in this treaty, as well as the critical role of women in disarmament. How does this relate to the existing Treaty on the Non-Proliferation of Nuclear Weapons (NPT)? The NPT envisaged a world of nuclear weapon states, and non-nuclear weapons states, with certain rights and obligations of each of these categories of states. While the obligation to pursue negotiations in ‘good faith’ to cease the nuclear arms race and eventually ensure nuclear disarmament was envisaged in the NPT, this has not materialised. Instead, nuclear weapon states are modernising and enhancing their nuclear arsenals. The distinction between nuclear haves and nuclear have-nots resulted in states with nuclear weapons such as India and Pakistan not signing up. North Korea withdrew from the NPT in 2003. It is also assumed that Israel has nuclear weapons. The designated nuclear weapons states per the NPT are the U.S., U.K., France, Russia and China. The NPT regime and much of the discourse pertaining to nuclear weapons has been considered from the perspective of security and deterrence. However, the main thrust of ICAN was to change this discourse to a more urgent consideration of the humanitarian consequences of the use of nuclear weapons. This treaty now places nuclear weapons on par with other weapons of mass destruction in the international legal regime. Chemical and biological weapons, cluster munitions and landmines are all subject to international legal prohibition, given their indiscriminate and disproportionate impact. Given the even more devastating consequences of nuclear weapons, their legal prohibition is overdue. While it is argued that nuclear weapon states not signing up to the treaty will undermine the aims of the treaty, it would be wise not to dismiss the norm creating function of this treaty. The articulation of legal obligations in an international treaty has an impact on the evolution of the norm of prohibition of nuclear weapons itself. Treaties relating to landmines and cluster munitions stigmatised non-state parties and resulted in compliance by such states. Nuclear weapons are a core concern of the majority of the states, with international legal proceedings initiated in many instances. In 1996, the General Assembly referred to the International Court of Justice for an advisory opinion on the legality of use of nuclear weapons, and the Marshall Islands instituted a case at the same forum in 2015, against nuclear weapon states (including India). While the former case did not relate to a specific dispute and had a mixed result, and the latter case was dismissed, they indicate the serious legal challenges brought against states that continue to amass nuclear weapons. Future legal challenges will only be strengthened, in light of the passage of an international treaty prohibiting nuclear weapons. While proponents of realpolitik may scoff at this development, in terms of the evolution of international law, let there be no mistake: the acceptance and entry into force of this new treaty is a significant step forward, and one that no state— including treaty non-signatories —can afford to ignore. The Nobel Peace Prize serves as recognition of this tremendous achievement in the unrelenting effort to outlaw these most heinous of weapons. Priya Pillai is an international law expert & consultant based in Manila.